Thermal or energy-based bowel injuries represent some of the most serious complications of laparoscopic surgery (6). Monopolar electrosurgical current is attributed with the greatest number of instrument-related mishaps. In the 1990s, the incidence of complications related to laparoscopic electrosurgery has been reported to be 2 to 5 per 1000. 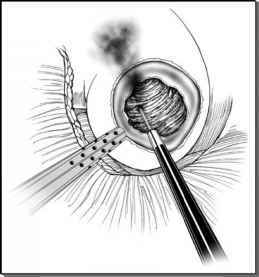 The most feared electrosurgical are bowel related and result from stray monopolar electrosurgical current. However, by using only metal ports and by never using plastic collars on metal ports, this problem can be greatly reduced. In recent years, the development of "active electrode monitoring" has been very helpful in detecting any "leak" of current. This equipment will immediately turn off the flow of electrical current whenever an insulation leak is detected. Patient's inability to void may be an early manifestation of bowel injury, or gastrointestinal bleeding can be an atypical manifestation of bowel injury. Knowledge of the biophysics of electrosurgery, and the mechanisms of electrosurgical injury are important to understanding and avoiding the potential complications of electrosurgery in laparoscopy. Electrosurgical injury can result from unrecognized energy transfer in the operational field or, less commonly, to unnoticed stray current outside the laparo-scopic field. The stray current can result from insulation failure, direct coupling, or capacitive coupling. Capacitive coupling is the most worrisome of these complications because it is difficult for the surgeon to defend against this problem. The most intuitive types of electrothermal injuries result from the direct application of an energy probe onto nontarget tissue as a result of unintended activation. Another form of electrosurgical injury results from defects in the insulation along the instrument. This type of insulation break may be increased when using a 5-mm insulated instrument through a 10-mm sleeve, because the 5-mm instrument is more likely to rub against the inside edge of a 10-mm trocar sleeve tip compared to a 5-mm one. Direct coupling results from unintended contact of a noninsulated instrument like a laparoscope or metal-grasping forceps with the active electrosurgical instrument. More worrisome, however, is capacitive coupling, which occurs when electric current is transferred from an active electrode through intact insulation into adjacent conductive material such as bowel structures. Capacitive coupling can occur with a hybrid trocar sleeve, which has a plastic anchor, stopping the transmission of current from the metal trocar into the abdominal wall over a large surface and allow capacitive coupling to adjacent bowel resulting in burns. Activating the electrode in the air when not in use will create an "open" circuit, which can also result in a capacitive current effect. Use of electrosurgical accessory safety equipment, which monitors active electrode, actively shields against stray current. Unfortunately, approximately 75% of electrothermal injuries are not recognized at the time of occurrence, and thus present in the postoperative period. The small bowel is the most frequently injured. Symptoms of bowel perforation depending on the severity of the coagulation necrosis are usually seen three to seven days after the procedure. The reports of histopathologic findings have been reported to have significant influence on medical-legal claims. The features are an area of coagulation necrosis, absence of capillary ingrowth or fibroblastic muscle coat reconstruction and absence of white cell infiltration except in focal areas of viable borders. Prevention of electrosurgical injuries is paramount. The best way to avoid elec-trosurgical injury is to avoid the application of monopolar energy sources. We have altered our surgical technique to minimize the use of laparoscopic monopolar energy. Application of alternative energy sources such as ultrasound energy (i.e., Harmonic Scalpela) or SonoSurgb and bipolar energy minimizes the need for monopolar energy sources and can reduce the risk of electrosurgical injuries. Electrosurgical injuries can also be prevented or minimized by regular equipment maintenance. The insulation on every piece of electrosurgical equipment should be checked prior to application. An active awareness by the surgical team of the principles of electrosurgery and the mechanisms of electrocautery injury can also be helpful in minimizing the risk of injury. ■ The management of electrosurgical bowel injuries can be challenging. ■ "Superficial" small thermal injuries to the bowel may be treated prophylactically with a laparoscopic-guided purse-string suture. However, as electrosurgical burns are more extensive than they appear visually, the purse-string suture should be placed well beyond the obvious demarcation of the injury. ■ If there is any question as to the "superficial" nature of the bowel injury, more aggressive management strategies should be employed. ■ If a deeper or perforating bowel injury is noted, a generous excision of the affected area of the bowel or, more commonly, a resection of a segment of bowel is required to prevent serious complications. Prevention of electrosurgical injuries is paramount. The best way to avoid electrosurgical injury is to avoid the application of monopolar energy sources. aEthicon, Cincinnati, OH. bOlympus America Inc., Melville, NY. and have less energy spread from the site of application compared to monopolar and bipolar instrumentation.